To those of you interested in signing up for Vivatic, consider reading our overview below to discover information about the website, how it works, the rewards, and the advantages and slight disadvantages of using it. Much of our information came from various Vivatic reviews left both by current and past users. Furthermore, we’ll discuss some frequent complaints that cropped up across several Vivatic reviews. These concerns deal with the low earning potential and issues with account termination. Vivatic is a London-based company that offers various opportunities to earn some extra cash. You can gain money by completing various tasks online. This is similar to other websites like Prize Rebel and My Survey. Is Vivatic Legit or a Scam? According to a good number of Vivatic reviews, the company does not appear to be an outright scam. However, there are important issues to address. Though it is free to join and there are ways that you can actually earn rewards (you even receive cash upon signup), there are a large amount of Vivatic reviews that complain about not receiving anything or having their accounts closed and banned for unknown reasons. Because of those concerns, though Vivatic isn’t a scam so far, there is a reason to take pause, and perhaps you shouldn’t expect too much from this website. Micro Jobs: There’s a micro jobs database you can access, and you can complete various tasks such as browsing a website to report any errors you might find. 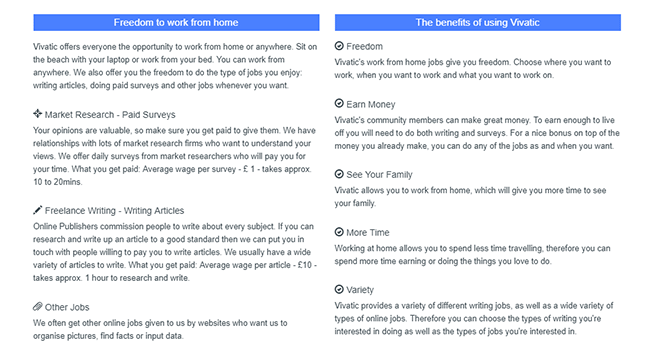 Writing Jobs: You can complete writing jobs for Vivatic to earn cash. Beforehand, though, you may need to a complete a number of micro duties to reach this point. Surveys: There is a market research panel that you can take part in. This usually posts new surveys each day. Polls and Competitions: You can participate in the polls or competitions available on the website as a way of earning some cash. Refer a Friend: Another way to earn cash is by referring a friend to create an account on this website. However, you only get the cash reward for it as long as your friend earns a minimum amount of money first. When you sign up for an account on Vivatic, it appears that the only reward available (as this review was written) is a cash payout. Many people do enjoy this, especially if they are looking to earn some quick money or are looking for a fast secondary income. However, it’s important to note that payments are only made monthly and just on the last working day of the following month. So, if you were to request a payout sometime in January, then you would not receive anything until the final working day of February. Another factor to consider is that there is a minimum payment threshold that you must meet before you can take anything out. You must have at least £20 in your account, and all payments are made in increments of £20. Also, you need to have a PayPal account as it is the only method Vivatic uses to pay its members. If the many Vivatic reviews from users we examined have anything to say, it’s that there are distinct ups and downs to using this platform. No signup fee: A trait that’s always desirable with any rewards website is the lack of a signup fee. In fact, Vivatic will actually give you £1 just for signing up. Many tasks: There are a good number of tasks that you can find every day. The jobs alone will certainly keep you busy and earning money while you complete them. Low earning potential: One of the biggest complaints waged against the company is the fact that you really won’t earn much in spite of all of the tasks you can do. This is largely due to how time-consuming it is sometimes to complete just one task, which makes it not truly worth it to many members. Several Vivatic reviews from members, both present and past, have drawn attention to the issues of not receiving many earnings from the site as well as losing access to their account without warning. In truth, there isn’t that much you can do on your own when it comes to trying to correct these problems. For the low earnings, the most you can do is set aside more time to complete a larger range of activities. You can join in on more competitions, find more writing jobs, and enhance your profile to be eligible for more surveys. As for the account terminations, there is little you can do to rectify the problem other than trying to reach out to the support team. You can also try contacting them on social media platforms. Remember though: there is the requirement that you must log in every 60 days to use the website. Some of the account issues may stem from this rule. Official website: On their official website, you can use their Contact Us feature to reach out to them (you get to select the conversation topic from the very beginning). Social media: Vivatic can (currently) only be found on Twitter, so if you have an account on this social media platform, consider trying to contact someone from the company that way. 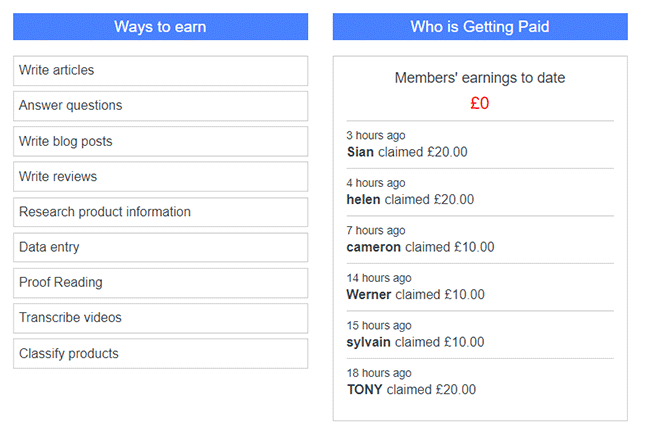 Vivatic is another GPT (get-paid-to) website that rewards members in cash for finishing different tasks. What makes it different from others is the fact that it offers actual jobs you can complete in the form of micro jobs, writing articles, etc. Even so, there are many Vivatic reviews from members that touch on the issues actually earning anything and losing access to their accounts. Though it’s legit, you may want to take this site with a grain of salt. Are you or have you ever used Vivatic before? Then don’t hesitate to tell us everything about your experiences with it, then!